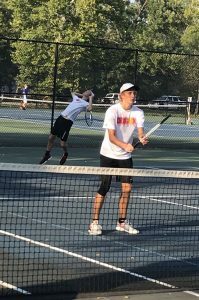 The New Palestine boys tennis team finished its regular season Thursday with a 3-2 victory at Chatard, capping a 14-3 regular season. Matthew True and Carson Gavin gave the Dragons two quick victories, each winning 6-1, 6-0 at No. 1 and No. 2 singles. The No. 1 doubles team of Ben Blachly/Dane Reid rallied from a tough first set to win 0-6, 7-5, 6-1 to win the clinching third point for the Dragons. Trevor Darley fell in three sets at No. 3 singles. Ethan Haeberle/Jeremy Wagoner fell in straight sets at No. 2 singles. The Dragons next compete in next week’s Mt. Vernon sectional. Dane Reid and Ben Blachly won their match at No. 1 doubles in three sets.